Is ‘new Rudy’ the real Rudy? Personality, by definition, denotes a person’s consistent, distinctive patterns of thinking, feeling, acting, and relating to others — and the “new Rudy” persona is distinctly out of character. Abrupt, drastic changes in behavior are more indicative of an individual’s response to powerful situational forces than of lasting personality change, and more often than not reflect transient, temporary adaptations to an immediate crisis. 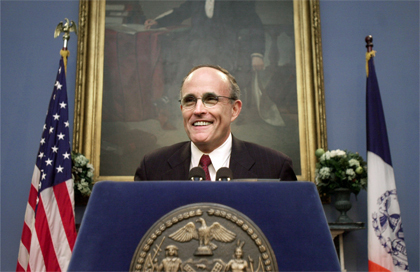 Claims of a new Rudy notwithstanding, logic dictates that Giuliani remains the dominant, controlling, aggressive personality whose combative orientation was as instrumental to his successful track record as a prosecutor as it has been in his crusade to clean up the mean streets of New York City. But personality style can be a double-edged sword. During his tenure in the mayor’s office, Giuliani has shown a potential for self-defeating rigidity and an unwillingness to compromise, with a penchant for berating his critics and assailing subordinates not acting fully in accordance with his wishes. Giuliani may be better suited for an executive position such as mayor or governor, but the venerable legislative body that is the U.S. Senate is no place for a bellicose brawler in which to advance his political ambitions. Unless, of course, there is substance to the speculations of a new Rudy emerging from the ashes of his aborted Senate bid in the face of a life-threatening crisis. Can the leopard change his spots? Studies suggest that close to 40 percent of the variance in personality and social behavior is biologically inherited. Biology, clearly, is not destiny; experience creates considerable wiggling room for personality change. Without denying the importance of critical events in human lifespan development, basic personality patterns are remarkably stable by midlife. In a sense, the more things change the more they remain the same. So, can the contentious, combative Giuliani tame the beast within? Fundamentally, no. But the fateful events of the past month have shown that the firebrand Giuliani is able to take stock of his priorities, see the bigger picture, and curtail his baser, more aggressive impulses. If his brush with mortality teaches Rudy to restrain the beast and harness its power more skillfully, he will emerge from this crisis as a formidable force in politics — no longer fuming but still with that old fire in the belly. Aubrey Immelman is an associate professor of psychology at the College of St. Benedict and St. John’s University, where he directs the Unit for the Study of Personality in Politics, a faculty-student collaborative project with the mission of conducting psychological assessments of candidates for political office and disseminating the findings to professionals, the national media, and the public. Joshua Jipson, junior English major from Lakeside, Wis., contributed to this article. Next story Can New York mayor Giuliani compromise despite his aggressiveness and moral certitude?